We are part of the Evangelical Free Church of America : We are committed to Jesus Christ, to the gospel and to one another. As an association of churches that aligns itself with the same Statement of Faith, we are distinct yet deeply connected. 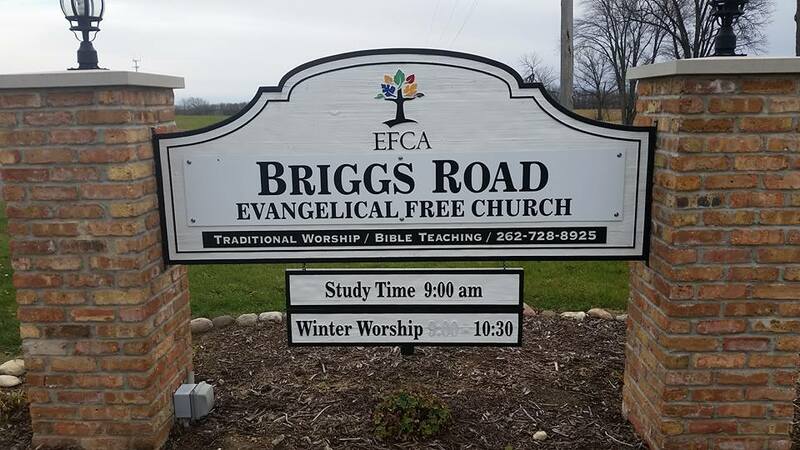 Briggs Road Evangelical Free Church was founded in 1994 under the name Community Church of Elkhorn by a group of like minded individuals who had a vision for an Evangelical church that would be open to all people and built upon the word of God. It is our desire to come together as a community of believers who love Jesus as our Lord and Savior. Our worship is warm and traditional, centered around a Biblical message. The programs and activities of the church focus on the spiritual Growth of the Church body. As a Congregation we exist to transform lives through God's word, into Christ-likeness. We do this through Worship, Fellowship, and Spiritual Growth, so that people might be reached, loved and discipled. Then mobilized in service of God and His Kingdom work. Summer Services- Beginning June 2nd, 2019 through Labor Day. 9:00 - 9:45 Bible class. 10:00- 11:00 am Morning worship service.